After my last post about CTB-Locker I received a lot of e-mails from people asking for a complete analysis of the malware. Most of them wanted to know if it’s possible to restore the compromised files without paying the ransom. The answer is simple: it’s impossible without knowing the Master key! That key resides on the malicious server and it’s the only way to restore every single compromised file. There are a some articles on the net about CTB-Locker’s modus-operandi. Everyone knows that ZLib is used, AES is used but only few of them mention the use of SHA256+Curve. To explain everything in details I’ll show you how encryption/decryption is done, step by step. HiddenInfo file is the core of the malware, it’s full of precious data. There’s no need to explain every field of the file, a closer look at the first part of it would suffice because it has an important part in the encryption/decryption scheme. Curve25519 is used to generate the corresponding public key. You can recognize the algo from Basepoint vector because it’s a 0x09 byte followed by a series of 0x00 bytes (For a quick overview over the Elliptic curve algorithm used by the malware take a look here: http://cr.yp.to/ecdh.html). GenSecretAndPublicKeys is called two times, so two private and two public keys are created. I name them as ASecret, APublic, BSecret and BPublic. Ok, now that you know how HiddenInfo file is created I can start with the file encryption scheme. InfoVector is a sequence of 16 bytes with the first four equals to “CTB1”, this tag word is used to check the correctness of the key provided by the server during the decryption routine. 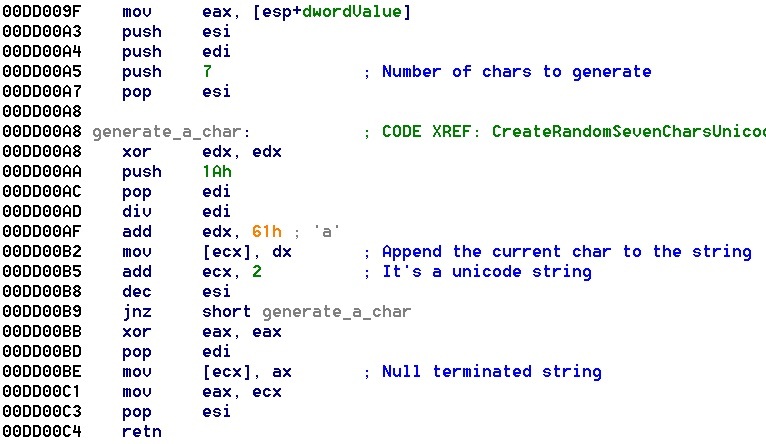 AES_KEY_2 directly. If you remember the key was saved inside HiddenInfo, there are a total of five saved keys. In this case if you have CSecret you can easily follow the process described above (remember that APublic comes from the first 32 bytes of HiddenInfo), but without CSecret it’s impossible to restore the original files. It’s important to note that in the encryption process CTB-Locker doesn’t need an open internet connection. It doesn’t send keys/data to the server, it simply encrypts everything! Internet connection is needed in the decryption part only. 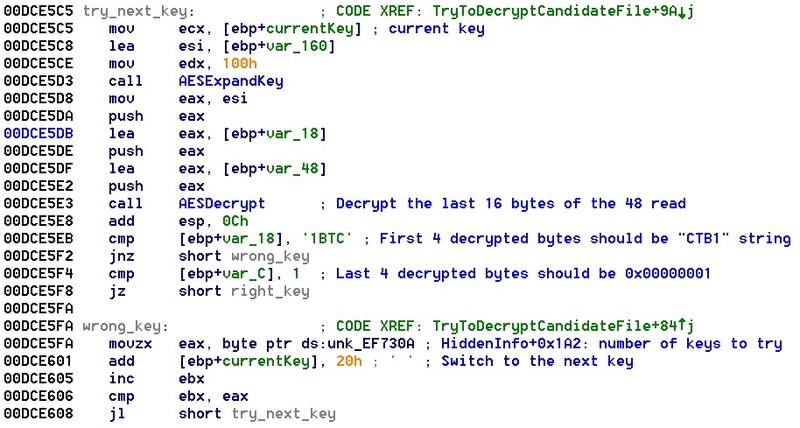 The unique key is sent just one time, so the decryption method needs only one key to decrypt all the compromised files. How is it possible? Shared_1 from the server is equal to Shared_1 calculated in the HiddenInfo creation part. Now, with Shared_1 it AES decrypts SecretInfo obtaining ASecret key. ASecret is the key used to decrypt all the compromised files. There’s nothing much to say really. CTB-Locker is dangerous and it will damage systems until people will do double-click over attachments.. sad but true. Feel free to contact me for comments, criticisms, suggestions, etcetc! The idea of this blog post was born after reading an italian article about CTB-Locker. I don’t remember where I read it, but a single phrase caught my attention. It sounds like: “the malware proves that it’s able to decrypt some files, so the keys are saved somewhere”. I received a CTB-Locker sample on my personal mail box, so I decided to give it a try, just to satisfy my curiosity. The post is based on a reversing session over a single file (810d51f6a5b4f8396ecf9407e427b999b316ecc28d53a759401143442b1a5cf8), but I think you can apply the general scheme to another sample of the same family. Basically, all the information required by the malware are saved inside two distinct files: HelpFile and HiddenInfo. You won’t find these two files on an infected machine because these are confidential names I used while I was reversing the malware, the real names are generated following a precise scheme. To understand how the real names are generated I have to introduce the very first crypto scheme used by the malware, this is very important for the entire encryption/decryption process. CoreHash is composed by 8 dwords and each one of them is used for a specific job, for this blog post I’ll focus on the first and fourth dwords. The real name is 7 bytes long and every single char is built after two simple math operations. HelpFile has “.html” extension and it’s used to show ransom info to the infected user, it’s just like a *FAQ* page on how to restore all the compromised files. The message is available in four languages: de, it, nl and en. This is the it version, but you can easily identify the server addresses, the tor access and the public keys. The last part of the file contains the list of the compromised files. Well… interesting but the keys I was searching for are not here! The real name of HiddenInfo is obtained in the same way, but this time the parameter passed to the routine is the first dword of CoreHash. The file is without extension, it’s an hidden file and there are 0x28E meaningless bytes inside. HiddenInfo is very important and it has a specific format, but everything is visible after a quite simple decryption process. I told you it’s simple. DD11B0 cmp [esi+28Ch], ax           ; Is checksum ok? The idea is simple: it tries to apply the keys to every single compromised file. It stops the process when all the right candidate files are found. The malware has a complete list of the compromised files. How does he know what’s the right key? The first and last dword are used in the key check. In the end of all, there are two simple checks to get the connection between a candidate file and his key. Now that the key has been found the malware is ready to restore the original file. This is done in two distinct steps, and it involves the entire file except the first initial 0x30 bytes. Decryption is done in blocks of 32 bytes (16 from the file and 16 equals to 0x00). The last step consists in a Zlib decompression (the compression is done with level 3). Now you have your original file back. Conclusion: the CTB-Locker demonstration process works with some files only and the keys are all hardcoded inside HiddenInfo file, it’s impossible to restore other files following this method. Curiosity satisfied, see you soon!